Why do people like to make jokes about lawyers and solicitors? We’re such friendly people! Here are five of my favourite jokes and quotes with an explanation of why most of them don’t apply to us (Warning – boring, long-winded, expensive lawyers may find these jokes offensive). A man says to his lawyer, “How much do you charge for 3 questions?”. One of the most common complaints about solicitors is that they don’t give adequate information about how they will charge. Ever received a bill you weren’t expecting? With our employment law subscription service, HR Complete, all our costs are explained to you in advance and are payable in 12 monthly instalments, which means you know exactly how much you will be paying and you can budget accordingly. Not so much a joke as a cynical quote from an English judge, Sir James Mathew (1830-1908). Obviously he felt that justice was a luxury for the rich! HR Complete is a package designed for small and medium sized businesses. The subscription cost is based on how many staff you have and your payroll, which means you can afford it, whatever size business you are. Doctor: I’m afraid it’s bad news, Madam. You only have 6 months to live. Patient: That’s terrible! Isn’t there anything I can do? Doctor: Well, you could marry a solicitor? Patient: Will that mean I’ll live longer? Doctor: No. But it will certainly feel like it. OK. So not everyone gets as excited about employment law as we do. Perhaps you’re not especially thrilled when yet another change to employment law is introduced. So what better reason for putting all your employment law needs in our hands, so you can get on with doing what you’re passionate about? We’ll keep you updated with what you need to know, look after your contracts and advise you on any problems that arise. Q: What do you get if you cross the Godfather with a lawyer? A: A man who makes you an offer you can’t understand. Sadly, some lawyers try to impress their clients by using long words and making the law seem inaccessible. We will explain everything to you in plain English and answer any of your questions as they arise. You can call us whenever you need help and it’s all included in the subscription fee. This is attributed to Abraham Lincoln. If you try to defend yourself in an employment tribunal, you may not be a fool but you’re likely to find yourself out of your depth. We’ve seen many people try to defend themselves in Tribunal proceedings and they often end up in an expensive mess. Our experienced solicitors will be glad to assist you with any legal proceedings you may involved in. 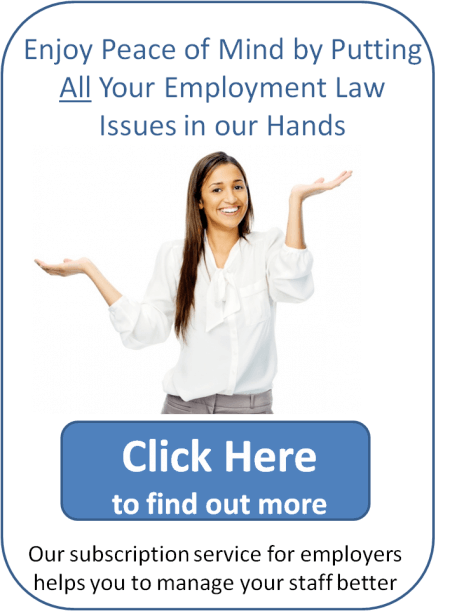 If you need help with employment law, simply give me a call and I’ll be glad to help! Next Entry: What’s the difference between unfair dismissal and constructive dismissal? What’s the difference between unfair dismissal and constructive dismissal?